Relocalization may be the most important strategy for minimizing climate change. According to Bill McKibben, “working as communities is the most important thing that we can be doing right now.” In this wide-ranging conversation about the sustainability of our civilization, McKibben shares his thinking about much more than climate change, including the fact that having “more” is not necessarily the key to our happiness. From November 30 to December 11 the world’s attention is riveted on COP 21, the 2015 Paris Climate Conference. 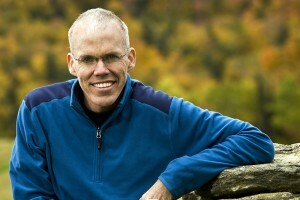 Bill McKibben has played a major role in public awareness and discussion about climate change. His 1989 book, The End of Nature, was likely the first book for a general audience about climate change. He’s one of the founders of the planet-wide, grassroots climate change movement, 350.org, he spearheaded resistance to the Keystone Pipeline, and launched the fossil fuel divestment movement. I sat down with McKibben in 2007, shortly after publication of his book, Deep Economy: The Wealth of Communities and the Durable Future, the year before he co-founded 350.org, for this macro-level look at climate change, human behavior and happiness, and public policy. Local food, small farms, suburban isolation, more leisure and less stuff, community connections, and greater satisfaction all came up for discussion. This is the 15th in our series of podcasts and radio programs. We post a new podcast episode every Thursday (we jumped the gun this week to avoid Thanksgiving). Be sure to subscribe! You can find us at iTunes, SoundCloud and Stitcher, or sign up to get an email every Thursday with the newest episode. If you like what you hear, please support this project with a tax-deductible donation. Your comments are invited below. Do you think we have to give up “more” in order to stabilize the climate, or can technology save the day? If technology can solve the climate problem (and that is a huge IF), what about the other environmental crises? Environmental journalist Bill McKibben is a former staff writer for the New Yorker. He was named to Foreign Policy’s inaugural list of the 100 most important global thinkers. The Boston Globe said he is “probably America’s most important environmentalist.” He is a scholar in environmental studies at Middlebury College, continues to advise 350.org, and speaks regularly about climate change.